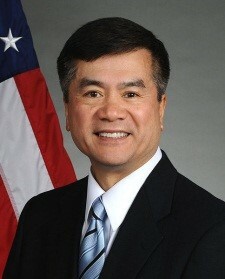 Photo-Gary Locke, United State Ambassador to China from August of 2011 until March of 2014. He was born in Washington State bordering on British Columbia and is a third-generation American with paternal ancestry from Taishan, Guangdong, China. Chinese British Columbians are people identifying or identified as Chinese sampled in the Canadian province of British Columbia. In the late 1770s, some 120 Chinese contract laborers arrived at Nootka Sound, Vancouver Island. The British fur trader John Meares recruited an initial group of about 50 sailors and artisans from Canton (Guangzhou) and Macao. At Nootka Sound, the Chinese workers built a dockyard, a fort and a sailing ship, the North-West America. The next year, Meares had another 70 Chinese shipped from Canton. However, shortly upon arrival of this second group, the settlement was seized by the Spanish in what became known as the Nootka Crisis. The Chinese men were imprisoned by the Spanish. It is unclear what became of them, but likely some returned to China, while others were put to work in a nearby mine and later taken to Mexico. No other Chinese are known to have arrived in western North America until the gold rush of the 1850s.